OBSCENITY! WHERE’S THEIR RISK MANAGEMENT? Economic depression: Falling output, rising unemployment and unsold stocks as a result of debt-induced ineffective demand, distinguished from recession by being prolonged and sustained. Michael West is one of the few journalists with a realistic grasp on where the Australian economy currently stands and where it’s headed. 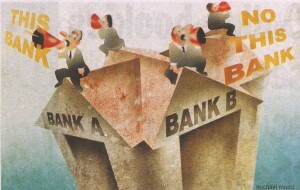 His installment in THE AGE today demonstrates the complicity of banks in bringing about social and financial collapse, and their expectation of being rewarded by taxpayer bailouts when the inevitable collapse does occur. Is not the current practice of banks lending against bubble-inflated land prices to make their billions in profits the very definition of obscenity? What’s that Ian, Mike, Gail and Cameron? “No evidence of a bubble in land prices?” What’s this then? if the rate of interest is high that encourges saving, cheaper land prices and cost of living. Now the bubble is so huge that higher interest will cause the depression that has been paperd over for a few decades by central planning and it will be so much worse. Its the meddling and intervention that has failed trying to control the economy. Yep–they’re hopeless–and Denise Brailey’s doing a good job exposing some of their more obvious excesses. Those at the top will get off scot free though, because they “didn’t know”. They’re meant to be the brightest of the bright, yet they can’t see the period since 1996 has witnessed Australia’s greatest bubble ever. Well, in face of the obvious facts, not all sing the same lying song that there is no bubble, for starters! The Big 4 are a cartel pure and simple. Here’s stunning evidence of the lending criminal conspiracy for every single lender in Australia, thanks to the efforts of Denise Brailey of the BFCSA Blog. Here is clear evidences of 100s of documents fraudulently altered for income and assets to get them over the line (turbo-charged sub-prime fraud), and not one single banker has been charged. How do you like your FIRE-sector friendly regulators and pollies now? The day when the Piper awakens from his slumber and calls to be paid will be the day when the share price of our big 4 banks plummet from record highs to zero.